With 78 half-hour episodes of LazyTown plus LazyTown Extra, I thought a thread dedicated to tracking down what episodes certain scenes are from could help out the userbase and other LT fans! I'm also looking for whatever episode "Mmm, mmm CREAMY!" was from (I used to know but forgot), and another episode where Ziggy was stuck in a tree and Robbie was like "Can't you fall a little quieter?" There was another scene where Robbie had a spit-take with the cake but it might be one of the episodes previously mentioned. I think this one comes from ""Little Pink Riding Hood"
I'm not sure about this one, but I thinks it's "Swiped Sweets or Dancing Dreams"
Ziggy was stuck in a tree and Robbie was like "Can't you fall a little quieter?" This might come from "Sportacus who?" or "LazyTown's New Superhero"
That volume control is from Sportafake. Don't know the time but it's in the first part of the episode. It's really a coincidence because I watched that episode-video yesterday from LazyTown-Spanish official YouTube channel and corrected the subtitles. Thanks for the help! I found the volume control but everything else is still a mystery. 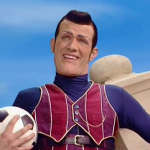 The episode where Sportacus kicks a soccer ball to a goal and then looks at it and says "I'm ready.". I found out where 'Couldn't he fall more quietly?' is from. it's from 2 episodes! The first is Ziggy's Alien, and it was with Stingy, not Ziggy, and the one with Ziggy is from Sportacus on the Move. It's my turn to have a question. All I remember from the episode is the park getting flooded by foam cubes. The episode where Chef Fantastico yells "GOAAAAAAAAAAAAAL." and then reveals that Soccer is his other passion. That one episode where Trixie (or Ziggy) calls Stingy "Stingy Fancy-pants". I don't remember the name of that episode. There is one simple and fast way to figure out where a certain quote is coming from and that is to search in the subtitle texts. It's a matter of seconds and you have the answer. Where do you search for subtitles? I don't see that option in the YouTube player, and using a search engine for "Stingy Fancy-Pants" turned up nothing. Try to ask the people of the best LazyTown Fansite on the netz. I'm very convinced about a scene where Ziggy (or Trixie) calls Stingy "Stingy Fancy-Pants". Ohhhhhh, okay. I think I forgot the name of the episode. Also, you need to quote me.